Like the martial arts, displacement can become idea, action and art. 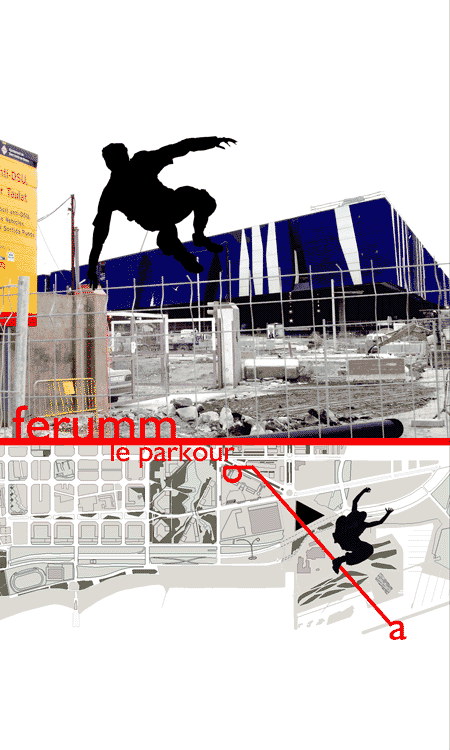 Parkour is a process allowing to extend human qualities while moving while using the medium. It is a question of overcoming all the adversities. This art can be practised independently, to two or in group. The partners advance according to a route called 'tracé'... They apprehend it thanks to a method tested by the initiator of known as Parkour: David Belle and Sebastien Foucan. >from *Parkour.net. Le site des pratiquants de parkour*. draw a straight line on a map of your home town. start from point a, and go to the point b. don't consider the elements which are in your way (barriers, walls, wire fences, trees, houses, buildings) as obstacles. hug them: climb, get over, jump: let your imagination flow: you're now doing parkour. "the day when all will be flat, we'll be dead." the people who practice parkour apply this principle on a physical level, and offers to transpose this attitude on a moral level. all depends actually on the way which the obstacle is taken. an obstacle in normal circumstances prevents us from going further, it paralyses. in parkour however, everything is viewed as an obstacle that can be used to create movement. >from *Art in motion*. > urban space and representation by iain borden. in the movement of the body across urban space, and in its direct interaction with the modern architecture of the city, lies the central critique of skateboarding - a rejection both of the values and of the spatio-temporal modes of living in the contemporary capitalist city. > theory of the dérive by guy-ernest debord. dérive [literally: drifting], a technique of rapid passage through varied ambiances. Dérives involve playful-constructive behavior and awareness of psychogeographical effects.